It was hard times at the school board Tuesday night, as boardmembers struggled mightily to pull the trigger on millions of dollars' worth of mandatory budget cuts. Going into Tuesday night’s Santa Barbara School Board meeting, one thing was certain: The children of our community were guaranteed to be the big losers in what was sure to be a full-scale assault on the district’s budget. The beans were spilled earlier this month when the district’s money guru, Ed Diaz, told the board that their new contract with the teachers’ union would necessitate some $3.35 million in cuts in order for the budget to meet the required three percent reserve. Trying as best they could to keep the cuts as far away from the children as possible, the board-led by trustee Bob No»l-entertained a number of creative options not indicated on the staff-generated 28-item proposed cuts list. Though he probably didn’t earn himself any friends by doing so, No»l unsuccessfully proposed that the district do away with its full-time public relations person, not hire a replacement for Assistant Superintendent Jan Zettel when he retires later this year, and that the boardmembers themselves no longer receive salary or health benefits for their jobs. Though the ideas would have added more than $150,000 to the budget, they were all soundly defeated by 4-1 votes. 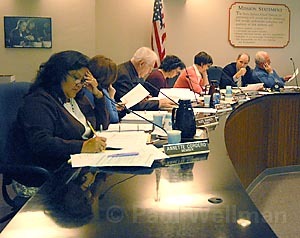 The boardmembers did eventually approve cutting their annual salaries in half, putting a much-needed $12,000 back in the pot.